With the concept of BPM fast emerging as a mainstream reality amongst businesses, the profession no longer hovers around automating a business, but serves as a nerve centre to a majority of mission-critical aspects, amongst which customer satisfaction rules the chart. Cost arbitrage has become the most powerful elixir for quenching the quest of reaping in the customer base advantage, the qualitative value, however, is often omitted. And unfortunately, not many companies understand the essence of quality. But for the rapidly growing companies like W3care Technologies, these are not only mere words, but a lifeline. Being a relatively young firm born in 2010, the entity provides quality, sophisticated, yet cost-effective web design and development solutions that not only leverages a sound online presence to the businesses, but also makes them effective and dexterous to blend in with the agility. 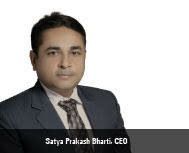 “We take pride in our on-time delivery and ability to meet quick turnaround requests while exceeding customer quality demands,” proclaims Satya Prakash Bharti, CEO, W3care Technologies. What started as a leisure pursuit of Satya is now a finest company, which has emanated to be a household name amongst more than 500 satisfied clients footed across multiple verticals. “Serving as an IT employee in different organization, I learnt the corporate culture, business process of IT and client management algorithms. I was inclined towards the processes and started to enable few projects as a hobby,“adds Satya. Under his headship, the company has designed and enacted innovative business processes which have fuelled the business growth of its customers. Born with the vision to streamline the web development processes, the process-driven organization endeavours to deliver market-defining high-quality solutions and professional script-to-screen approach that creates value and consistent competitive advantage for a business. Architected on the advanced technologies, which include PHP frameworks and open source development platforms, the customized solutions are powered by the creative blend of talent and technology of the dedicated team. Here, customers can enjoy complete ownership of all intellectual property rights and software source code, while the most critical part - the safety of such innovations - are safeguarded by the best minds of W3care. Apart from web solutions, the company specializes in mobile app development, QA & testing services, content management system, logo design services and such other domains. The solutions are weaved around the values of honesty, transparent system, reliability and quality deliverables, which have in turn pushed W3care to the higher end of the spectrum.